New research suggests the Earth was pummelled by four gigantic asteroids measuring at least 600 miles across in its early days — impacts that would have rebooted the surface, boiled off the oceans, and extinguished any fledgling life. Here's what we now know about the Late Bombardment Era and its affect on our planet's geology. Top image: An artistic conception of the early Earth, showing a surface recently scarred by a large impact. The collision resulted in the ejection of deep-seated magma onto the surface. But at the same time, the distal portion of the surface would have been able to retain liquid water. Simone Marchi. 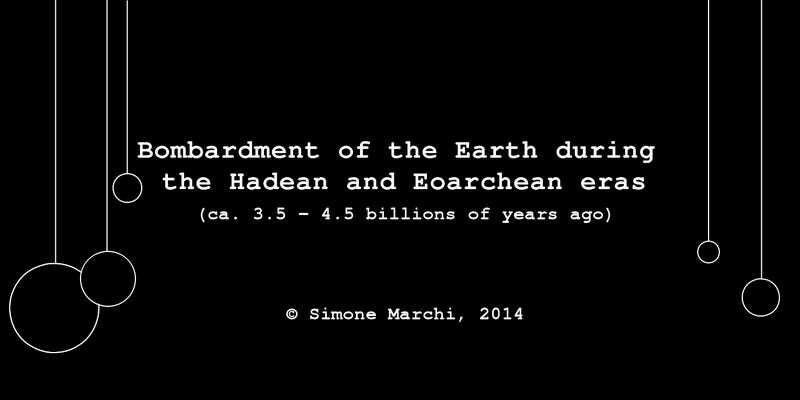 During the geologic Hadean eon, an era that transpired some 4 to 4.5 billion years ago, our planet was hit by large asteroids on an all too frequent basis. These massive collisions facilitated the regular reprocessing of the surface — impacts that melted, mixed, and buried sizeable portions of our planet. A new model developed by an international team of researchers and government institutions — including NASA's Solar System Exploration Research Virtual Institute (SSERVI) — shows how these repeated impacts buried Earth's earliest and oldest rocks. What's more, the research shows how our planet bounced back from these disasters and how this healing process eventually allowed for habitability. Our planet went through at least three distinctive formative phases. The first was the accretion of planetesimals over the course of many tens of millions of years. This was followed by a giant impact by a large protoplanet that led to the formation of our moon. Finally, there was the Late Bombardment Period (LBP) — a time when giant asteroids several tens to hundreds of miles in size periodically struck the ancient Earth. There have been severe impacts since then, including a 36 mile-wide (58 km) rock that struck 3.26 billion years ago and the relatively tiny 6 mile-wide (10 km) asteroid that contributed to the demise of the dinosaurs 65 million years ago, but the frequency of these later collisions — and their monumental size — simply doesn't compare to what went on during the LBP. Indeed, the sheer size of these asteroids boggle the imagination. 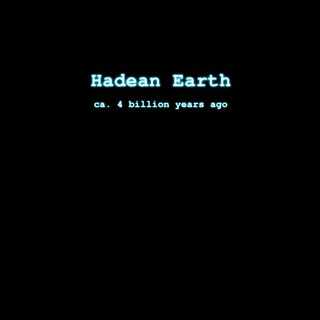 The researchers found that, on average, Hadean Earth was hit by at least one to four impactors more than 600 miles wide (965 km). These collisions would have resulted in complete global sterilization. They also believe the Earth was struck by at least three to seven impactors measuring more than 300 miles wide (482 km). These sizeable impacts would have vaporized the planet's oceans. "During that time, the lag between major collisions was long enough to allow intervals of more clement conditions, at least on a local scale," noted study co-author Simone Marchi in a NASA statement. "Any life emerging during the Hadean eon likely needed to be resistant to high temperatures, and could have survived such a violent period in Earth's history by thriving in niches deep underground or in the ocean's crust." Fascinatingly, Marchi used the Moon's crater record to develop a computer model of Earth's bombardment history. The model combines simulations of impacts with theories of planetary formation and data from samples of lunar and terrestrial rocks. The team was also able to estimate the total volume of asteroids that hit the Earth and Moon by measuring the amount of elements such as gold and osmium in their crusts. The researchers say that all the accretion during the LBP contributed to less than 1% of the Earth's present-day mass. Still, the impacts had a profound effect on the geological evolution of the early Earth. Prior to the end of the LBP, the Earth was continually resurfaced by voluminous impact-generated melt. These impacts would have also repeatedly boiled away existing oceans into steamy atmospheres. 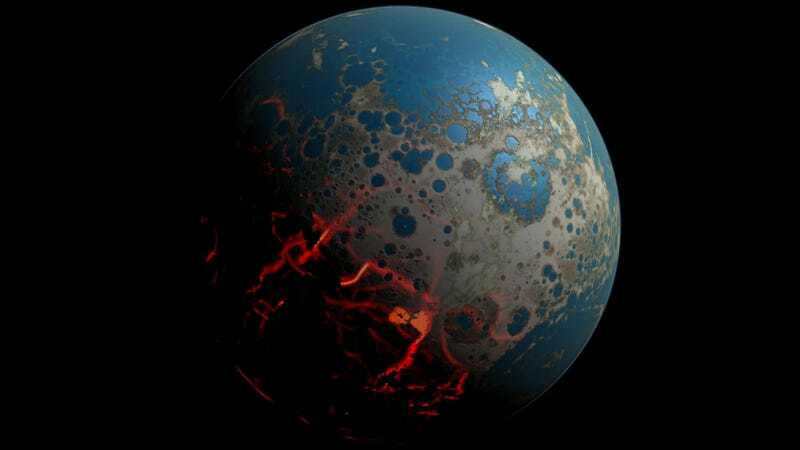 At the same time, and despite the heavy bombardment, the findings are consistent with the suggestion that liquid water existed on the Earth's surface in large volumes as early as 4.3 billion years ago. In addition to affecting our planet's geology, these collision also played a major role in the subsequent evolution of life. "Prior to approximately four billion years ago, no large region of Earth's surface could have survived untouched by impacts and their effects," said Marchi. "The new picture of the Hadean Earth emerging from this work has important implications for its habitability." John Valley, a geochemist at the University of Wisconsin–Madison, says that the study does not show definitively that Earth was uninhabitable 4.3 billion years ago. He points out that the effects of each impact would have been short-lived, leaving habitable spells between blasts, and impacts would not necessarily have melted the entire surface of the planet. Life could have started multiple times, or existed in rocks more than 1 kilometre below the oceans, he adds. Without a doubt, though, if life did exist back then, it would have been extremely hardy. Read the entire study at Nature: "Widespread mixing and burial of Earth's Hadean crust by asteroid impacts". Additional information via NASA.